heather & olive: christmas card 2013. I love getting Christmas cards. 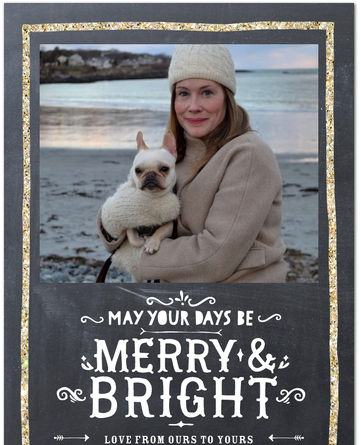 I also love sending my own, but this year I had a moment of panic when I wondered if I was totally lame to send the clichéd "single girl with her dog" card. I expressed my misgivings to my professional photographer and confidant (my mom) and she asked what I was embarrassed about: this is my life right now, and I'm happy with it. I love that picture!!! I don't send cards. Mainly because I'm lazy, but maybe next year I'll get a good shot of Jax and me. And your mom is a smart cookie. That is the best advice and the card is amazing! Love it... I wanted to do one of me and Ruby, but we aren't that photogenic.